The title, “ROUGH STUFF” is a deliberately ambiguous play on words. The viewer might immediately expect an exhibition of woodfired ceramics with great accumulations of ash imbuing the surfaces with chthonic primordial landscapes. And yes, viewers will find some of that rich technique in this exhibition, but in fact we had something else in mind. We live in cynical times. In cynical times the first concept to be sacrificed to the beasts of dogma is most often ‘beauty’ or ‘grace’. To us, beauty makes rough and exquisite demands that the onlookers slow down and, however briefly, give themselves up to its call. Beauty becomes a warrior in a performance reaching back to archaic times. We wanted the clay to live in this exhibition. It is common to link sculpted clay to landscape but landscape is changing all the time right in front of us, especially now. 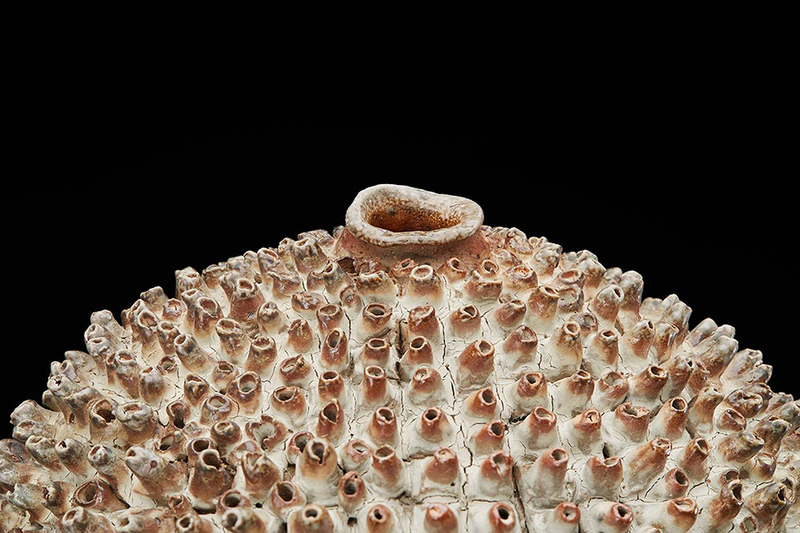 Landscape is umbilically linked to Place, and the art that Cavin-Morris Gallery shows, from Art Brut to Ceramics (sculptural as well as tea and sake) to Ethnographic has always been closely linked to the myriad ideas Place awakens in the artists’ mind. It can be untouched and euphoric all the way to dystopian. That is really what we mean by ROUGH STUFF: A celebration of Wild Surface. It is an exploration of the idea that never has earth, air, fire and water been more interactive with our daily lives then now. Like the tensed horse head in Picasso’s Guernica our earth in all its beauty and ugliness is screaming to be heard. Through the translations of visionary artists we can hear its real voice. 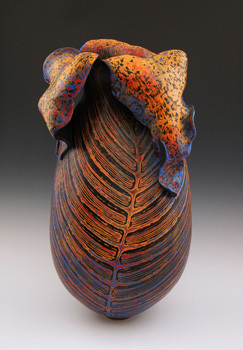 Sculptors who use clay work with the raw essence of the planet most of us take for granted. We wanted special work for this exhibition and we found it, both in the powerful artists we have shown for years and with the addition of some new to us amazing sculptors to further augment the vision. We deliberately chose to emphasize the non-utilitarian aspects of their work, with very few exceptions. We looked for experimenters with local clays, with edgy aesthetics, with obsessive workings of surface both in naked clay and glazed, but which never stopped respecting the clay body. In truth; and pun intended, we only scratched the surface and regard this exhibition to be a major premonition of what we are going to continue to explore in our clay department at Cavin-Morris in the future. Group Exhibition: Mavericks II, celebrates new works received in 2018 by gallery artists including Joseph Lambert, Izabella Ortiz, Caroline Demangel, Joseph Hofer, Sylvia Katuszewski, Chrissy Callas, Sandra Sheehy and others. The exhibition also welcomes new artists to the gallery including Davood Koochaki, Issei Nishimura, Dwight Mackintosh, Donald Mitchell, Alex Xatkevich, and Ezekiel Messou. 2018/2019 Blick Art Materials catalog, to be published soon! 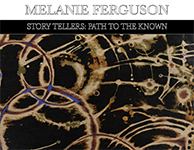 A solo exhibition featuring new ceramic works from the Storyteller series and recently released works from artist’s archive collection of works. "THIS IS WHAT CLAY CAN DO: A Meditation"
"This exhibition is a meditation on one of the oldest art materials known to man, one of the least limiting and most versatile mediums. Cavin-Morris combined selected works by some of the most sophisticated ceramic artists we exhibit, including Rebecca Buck, Simcha Even-Chen, Melanie Ferguson, Yukiya Izumita, Kentaro Kawabata, Young Bin Lim, Shozo Michikawa, Akihiro Nikaido, Rafa Perez, Sarah Purvey, Tim Rowan, Keiichi Shimizu, Phyllis Kudder Sullivan, Kai Tsujimura, Mike Weber, and Jane Wheeler and set them alongside ceramic sculptures from the Middle East, India, Greece and Pre-Columbian America. This exhibition highlights the intense demands of clay from culture to culture, accentuating the fluidity of its eternal potential." For further information please email info@cavinmorris.com, or call 212-226-3768. 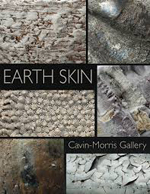 "EARTH SKIN: New Ceramics at Cavin-Morris"
New ceramics at Cavin-Morris Gallery with Akira Satake, Kukuli Velarde, Melanie Ferguson, Youngbin Lim, Sarah Purvey, Tim Rowan, Eddie Curtis, Lesley McInally, Mitch Iburg, Akihiro Nikaidou, Simcha Even-Chen, Rebecca Buck, Shozo Michikawa, Rafa Pérez, and others. 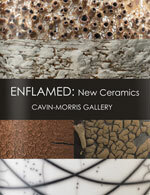 Read the Hyperallergic "Enflamed" Review here. 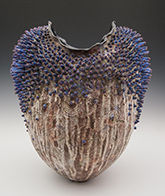 "Corrina's Dance" was selected to appear on all promotional materials for De La Naturaleza, an exhibition of contemporary ceramic art at Franklin Park Conservatory and Botanical Gardens, in partnership with the Central Ohio Clay Arts (COCA), opening January 9 - March 6, 2016. 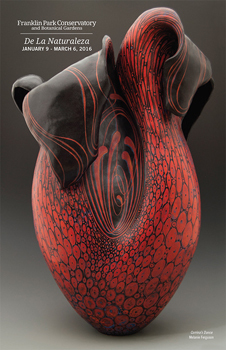 "Lead With Your Heart" (2013) was acquired for the permanent art collection of the Alabama College of Osteopathic Medicine, Southeast Alabama Medical Center Foundation.